Pope Francis accepted the resignation of Jesuit Father Federico Lombardi, who has been serving as Director of the Holy See Press Office, and has appointed to the position American journalist Gregory Burke, who has been serving as its vice-director. In a statement this afternoon, the Vatican announced the new director, as well as new vice-director, Spanish journalist Paloma García Ovejero. Greg (Gregory Joseph) Burke was born on November 8, 1959 in Saint Louis (United States) by a practicing Catholic family. After attending one of the city’s Jesuit high schools, he graduated in 1983 in Comparative Literature at New York’s Columbia University, before specializing in journalism. In those years, he became a numerary member of Opus Dei. In 2001, he started working for television as Rome correspondent for Fox News. In 2012, he worked in the Vatican Secretariat of State, Section for General Affairs, as communications consultant. 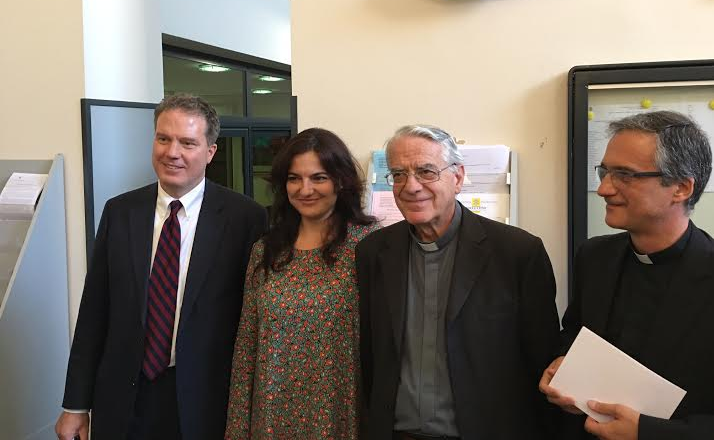 Since Dec. 21, 2015, he has served as Vice-Director of the Holy See Press Office. Greg Burke knows English, Italian, Spanish, and French. Paloma García Ovejero was born in Madrid on Aug. 12, 1975. She graduated in journalism in 1998 at the Complutense University of Madrid, where she obtained a master’s degree in Estudios Vascos (Jakinet / Uned, 2001) and a specialization in Management Strategies and Communication (at New York University, 2006). Since 1998, she has been editor and presenter of “Cadena Cope, Radio Española,” with the title of Editor-in-Chief. Since September 2012, she has been correspondent for Italy and the Vatican City, collaborating not only for the “Cadena Cope, Radio Española,” but also with other television stations and several newspapers. The new vice-director also knows Spanish, English, Italian, and Chinese.